In Locating Localism: Statecraft, Citizenship and Democracy, Jane Wills explores the development of localism in the UK and the structures that both encourage and impede the transfer of decision-making to the neighbourhood level. While the book occasionally lacks engagement with the precise relationship between devolution and localism and the political struggles occurring within communities, Richard Berry praises this as a powerful, coherent perspective and a highly important contribution to the emerging literature on localism. Locating Localism: Statecraft, Citizenship and Democracy. Jane Wills. Policy Press. 2016. 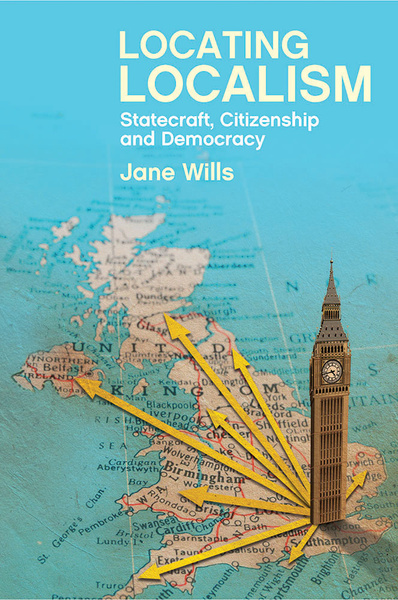 In Locating Localism: Statecraft, Citizenship and Democracy, Jane Wills focuses her attention on the kinds of politics and places that are usually overlooked in political science. Combining analysis of political discourse with detailed case studies of multiple communities across the country – namely, in London, Leeds and Exeter – the book explores the weaknesses of Britain’s local civic infrastructure, and how decision-making powers could be devolved down to the neighbourhood level. In the first chapter of the book, Wills assesses the current political momentum towards localism and describes some of the inherent tensions involved. Chief among these is the distinction between ‘top-down’ and ‘bottom-up’ localism. Top-down localism is the sort that has been most prominent recently, especially while George Osborne led efforts to create new city-regional structures as Chancellor of the Exchequer. This is the localism of ‘responsibility, funding and authority’ being transferred from Whitehall to local authorities (15). Arguably, Wills is too quick to conclude that community and citizen empowerment is a more important form of localism than political devolution – or, indeed, that the two can genuinely be separated. For instance, she notes that free schools have the potential to give local people greater control of school provision in their area (37). She does not, however, consider arguments from free school sceptics about how the disempowerment of local authorities in education might be skewing provision toward the more affluent parts of the population and undermining existing community schools. This is despite recognition elsewhere that wealthier, better-educated people are more likely to be involved in local civic life (89). One of the most intriguing sections of the book is in Chapter Three, where Wills explores the history of localism. While we might think of localism as a fairly recent trend in British politics, Wills shows just how long these ideas have been around. For instance, she discusses the Community Development Programme introduced by Harold Wilson’s government in 1970, which used language that would not look at all out of place today. That these past localist projects failed to sustain themselves is a warning from history that Wills is clearly eager for today’s localists to heed. First, it exposed the extent to which the local community lacked the civic infrastructure to provide the means to engage in any meaningful way. Second, and relatedly, it exposed the extent to which state-funded organisations retreated to the use of basic community consultation activity in the absence of a strong community voice (100). There are many other important lessons in the book. In Lambeth, Wills finds through studying a community-based commissioning project that a range of community organisations were already doing important work locally, often in conjunction with elected councillors, which council staff themselves were not fully aware of (129). Much of this was down the existence of a broad-based neighbourhood institution, the Tulse Hill Forum. However, there is relatively little consideration of political struggles that may be taking place within communities. Wills seems to perceive all neighbourhood politics as non-partisan, and praiseworthy for that reason. There is a rather uncritical reference to the emergence of ‘independent’ political groups on local authorities (201), which overlooks the partisan origins of many of these groups. Although this is not necessarily a flaw of the book, it would have been interesting to read further discussion of what non-partisanship means for neighbourhood politics. Looking at localist experiments in different places and of different types, Wills concludes that all require some institutional focus to succeed in bringing local people together effectively. The examples she considers achieved most when there was an effective neighbourhood forum in place to channel local activity. She also gives a lot of weight to the development of new parish or community councils in urban areas, a very encouraging trend. Wills’s recommendation that these institutions need to be established and to receive the necessary support and investment is one designed very much with Whitehall and town hall policy-makers in mind. The chief value of Locating Localism lies in its focus on real communities and its exploration of what the much-vaunted concept of localism means – and what it should mean – for people trying to participate in local decisions that affect their lives. Going beyond merely a series of case studies, Wills draws insights that should inform further research and public policy. This makes her book a very important contribution to the emerging literature on this topic. Richard Berry (@richard3berry) is a scrutiny manager for the London Assembly, the body elected to scrutinise the Mayor of London, and manages investigations on behalf of the Economy Committee. He is also a Research Associate for Democratic Audit. Lambeth’s so-called ‘co-operative council’ experiment was a sham – to the point that they even dropped the tagline from their website. It was a vanity project of Steve Reed’s and certainly residents on many estates threatened by regeneration, library campaigners, residents of 40-year-old housing co-ops, garden bridge campaigners and many others have paid the price of the manipulation and conceit of both the ruling group of councillors and their officers. A model for localism? More like call for the auditor. To clarify – that’s anti garden bridge campaigners, of course.